File Name: 9 Awesome Science Tricks Using Static Electricity! Music in the video are songs I created. All of these tricks take advantage of static electricity. In general, the lower the humidity, the better these tricks will work. The most impressive one to me is the floating bag trick. Depending on the conditions, you can float an entire grocery sack. 1. 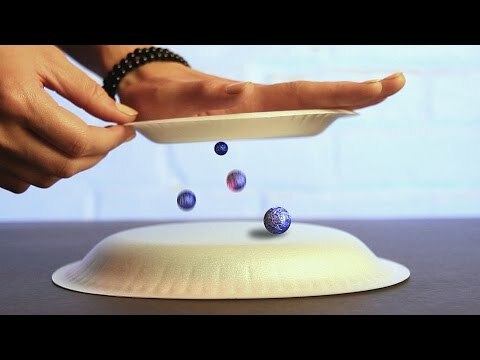 Hover Plate: (You need Styrofoam Plates and a cloth) Styrofoam plates are great for static electricity tricks. When you give them a charge and hold one above the other, you can feel an incredible amount of resistance. 2. Can Can Go (You need a coke can, PVC pipe and a cloth) This is a classic but still fun. Try standing the can up and then tip it over with static, or try pulling 2 cans at the same time. 3. Stick Around (You need a small wooden stick, glass jar, thread, tape, PVC pipe and a cloth) This one is fun because half of the time the wooden stick will come toward the pvc pipe, and other times it will move away from the pipe. When it moves away, it will stick the the side of the jar and remain there for a period of time. It also fun to use as large a jar as possible to increase the dramatic effect of the pipe moving the stick from such a large distance. 4. Bubble Trouble (You need bubble solution, plexi-glass, PVC pipe, straw and a cloth. This is a fun trick because the bubbles change their shape and move when the pvc pipe is near. It's also fun to create bubbles inside of bubbles to watch the effect of the static electricity. And also create multiple bubbles on the sheet and watch them all travel toward the pipe. 5. Dancing Balls (You need styrofoam balls, aluminum foil, plexi-glass, cloth, and an area to keep the balls from escaping. This trick is really impressive but can be a bit difficult to recreate. When the plexi-glass plate is charged and placed over the balls, they all jump up and stick to the bottom of the glass. For a few moments they travel around sporadically until they finally settle. But when you put your finger near the glass, they all start jumping around. It's also fun to use these balls with styrofoam plates / cups. If you place the ball on a charged plate, it will shoot off of the plate, or stick to it, even if the plate is held sideways or upside down. 6. Water Bender (You need a cup that you can poke a hole in, water, PVC pipe and a cloth. This is a classic but still fun. 7. Balloon Fight (You need balloons, thread, PVC pipe and cloth. When the conditions are just right, the balloon can almost levitate about the pipe. But most of the time you can have fun pushing the balloons around with the charged pipe. 8. Electroscope (You need, steel wire, jar, straw, aluminum foil, PVC pipe and a cloth) This one is really impressive to see in person. A really cool effect to try, which you can see in this video, is to rub the cloth on the pvc pipe from several feet away from the jar. When you run the pipe, you can see the aluminum foil pieces in the jar, moving. I was able to stand as far as 5 feet away and still see the effect. 9. Wingardium Leviosa (You need very light weight / thin plastic bags, cloth, PVC pipe) This is my favorite trick. Again, with the correct conditions, you can get the plastic pieces to float over foot above the pipe. Produce bags from the grocery store work great. You can float an entire produce bag in the right conditions.